Senden Sie Geschenkkörbe heute nach Kiew, Tscherkassy, Chernigov, Czernowitz, Dneprodzerzhinsk, Dnepropetrovsk, Odessa, Nikolaev, Zaporozhye und anderen Städten der Ukraine! Geschenkkörbe ab $ 64,99. Lieferung von Obstkörben in der Ukraine Lieferung am selben Tag. Online Geschenkkörbe Lieferung in die Ukraine. Fruit basket. A perfect gift basket that will convey your heartfelt wishes of love and care to y..
Big Fruit basket. 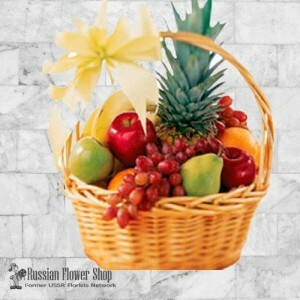 Assorted fresh fruit basket of delicious seasonal fruits including a pineapple. .. Delight basket. 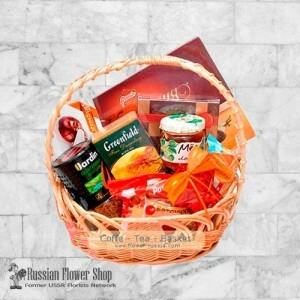 Grapes, pineapple, pears, caviar, olives, candies, tomatoes, cucumbers, cheese, sa..
Coffe - Tea BasketThe basket includes: chocolate candies collection, zephyr, candy bars, cookies, te..